RIAA has issued its semi-annual report on U.S. music business sales, shipments and revenues through the first half of the year. During 1H, revenues from music streaming services surpassed $1 billion for the first time, growing 23 percent in 2015 to $1.03 billion, up from $834 million for 1H 2014. Revenues from permanent digital downloads (including albums, single tracks, videos, and kiosk sales) declined 4 percent to $1.3 billion for the first half of 2015. 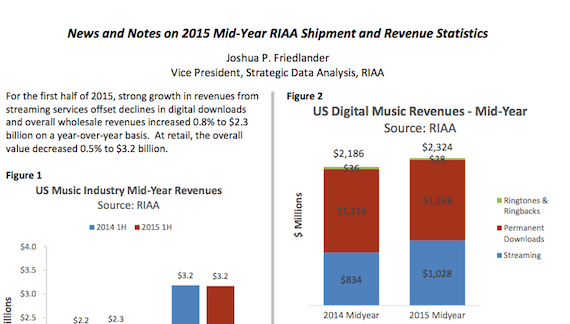 Total value of shipments in physical formats was $748 million, down 17 percent versus 1H 2014. RIAA Chairman and CEO Cary Sherman commented, “The data continues to reflect the story of a business undergoing an enormous transition. There are many positive signs: continuing the trend from 2014, wholesale revenues for the first half of 2015 increased. And revenues from streaming music services continue to grow at a healthy double digit rate. The product of music and the extraordinary roster of artists represented by today’s music labels remains in high demand. That is the bedrock of a successful future. Click to see the report.